I'll give this a try. Just what I need--a gentle reading boost. 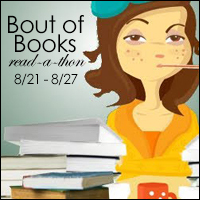 "The Bout of Books read-a-thon is organized by Amanda Shofner and Kelly @ Reading the Paranormal. It is a week long read-a-thon that begins 12:01am Monday, August 21st and runs through Sunday, August 27th in whatever time zone you are in. Bout of Books is low-pressure. There are challenges, giveaways, and a grand prize, but all of these are completely optional. For all Bout of Books 20 information and updates, be sure to visit the Bout of Books blog." Bout of Books is a lot of fun. One of my favorite readathons! It is fun--I did one last year.